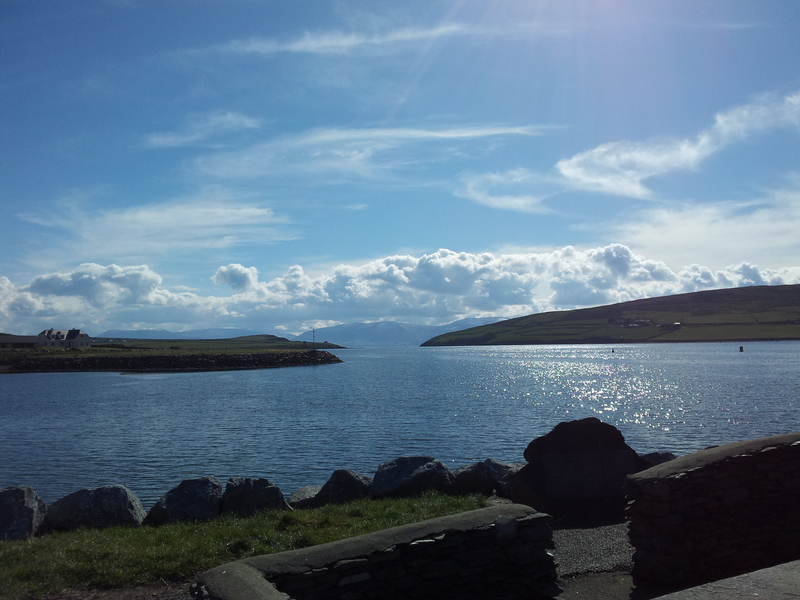 Welcome to Dingle Holidays’ Dingle Events Guide. Here are some of the events and festivals scheduled to take place across the Dingle Peninsula throughout 2018. Make the most of your stay and book your self catering accommodation in Dingle with Dingle Holidays. Saint Patrick’s Day celebrations in Dingle begin at 6 a.m. when the town’s Fife and Drum Band lead the townspeople on a musical march around Dingle. At 1 p.m. the main Saint Patrick’s Day parade begins its journey around the town’s streets. Parades are also held in Ballydavid, Ballyferriter and Castlegregory. Biking over the spectacular winding Conor Pass, following in the footsteps of St Brendan climbing Ireland’s second highest Mountain range Mt Brandon, running country roads of the peninsula and kayaking in Dingle Harbour. Visit www.dingleadventurerace.com for information and registration. 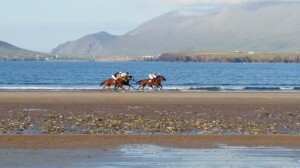 The horse and pony racing at Beal Bán beach take place annually at Ballyferriter, Co Kerry. The Summer Festival is known far and wide for family entertainment. There are lot of events geared towards family involvement including summer festival queen selection, dances/discos, pet show, amusements, treasure hunts and much much more. Details are on the Castlegregory Tourism Website. 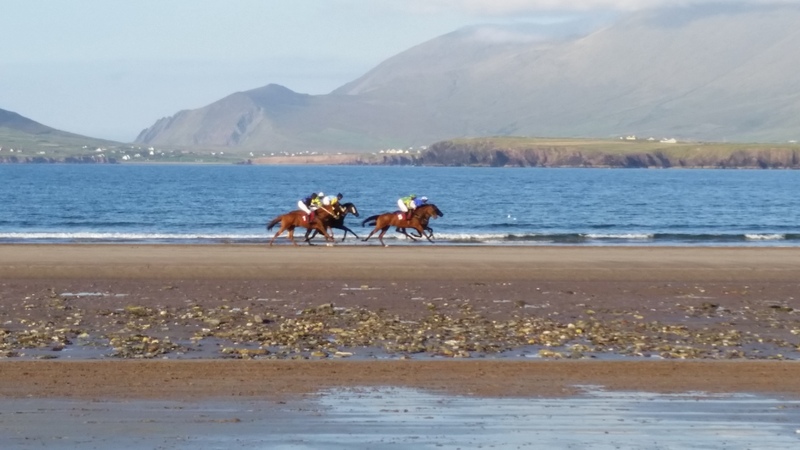 The Ventry Regatta is a two day festival of sporting and cultural activities in and around the village and beach of Ventry. In addition to naomhóg racing there will be family sports, beach art, poetry, dancing, walking and horse shoe throwing. Details will appear on the regatta website www.regattafionntra.org. An annual revival of the ancient Celtic Harvest festival. In Irish mythology, the Lughnasa festival is said to have been begun by the god Lugh and heralds the changing of the seasons and the harvest of the land. One of the highlights of the festival is the ascent of Mount Brandon with music and poetry reading at its peak. Events include a Hy-Breasal play; a fancy dress parade; farmers market; street entertainers, open air dancing, sheep shearing, dog trials along with great sessions in the local pubs and much more. Traditional naomhóg racing, plus a number of cultural activities and walks. Visit www.gokerry.ie for more information. Ireland’s Largest & Best Horse & Pony Meeting. Every year in August, the field at Ballintaggart changes into an enormous racetrack filled with horses, jockeys and horse racing enthusiasts from all over Ireland and the rest of the world. A two-day programme of highly competitive races displaying the skill and expertise of the boat men and women of Corca Dhuibhne and further afield in Dingle Harbour. Competitors from West Kerry are joined by crews from the Maharees, Brandon and as far away as Donegal and Clare at this annual event. Dingle Rowing Club Facebook Page for more information. The Brandon Regatta is the last rowing contest of the summer and is held in late August every year. Boat races take place from the village’s fishing pier. The event is also marked by music, song and festivities in the local pubs and on the village’s waterfront. Dingle Rowing Club Facebook Page for more information. A half and full marathon around the spectacular Dingle peninsula. This is a ‘must do’ race guaranteeing a once in a life time experience. Dingle Marathon is famous for its breath taking scenery and beautiful rugged coastline. Over 17 miles of the route is on or next to the sea. Dingle Town comes alive this weekend with an incredible atmosphere and craic guaranteed all weekend. Highlights of the Dingle Peninsula Food Festival include a taste trail in over 60 outlets, where festival goers can purchase taste tickets and sample local cuisine delights in locations that vary from pubs, and galleries to shop and restaurants. Plus lots of on street entertainment, music and fun for all the family!